As anyone who’s listened to more than an episode or two of the Aggrochat podcast can verify, I have what you might call Strong Feelings about World of Warcraft. I’ve been all over the spectrum with the game, and have landed in a kind of complex position. Possibly worth mentioning, if the post title didn’t give it away: I’ve been playing WoW again, a little bit, and it’s given me some context and ability to articulate how I feel about the game. Maybe you feel similarly. First, and importantly (though it’s something that often gets dismissed so I can move onto the parts that I find more interesting), WoW is definitively an excellent game. There is a reason it is as successful as it is, and quite frankly any attempt to deny that it’s a great game is simply blindness. It isn’t without flaws, and there are other reasons to dislike it, but it’s the pinnacle of a certain type of game that competitors have tried to top for a decade and failed. It has more than ten years of evolution, to the point where it’s reached that magic MMO point of being multiple games all at the same time, all appealing to different people and bringing them all together into one place. Second, WoW has a lot of history. It has, quite frankly, an unwieldy, overwhelming amount of history that is scattered throughout its playerbase. Some things have to give somewhere, and WoW has made it choices as far as what it wants to give up to make the game more focused and less crushed under its own weight. It knows it’s alienated some of its players with these choices, and it’s okay with that. I’m one of those players. Third, WoW is dated. It felt dated when I last played in Pandaria, and four years later and many other games, coming back to WoW feels like installing an old, nostalgic title, even though it just released a new expansion. It’s the kind of thing that’s hard to see if you haven’t played many other, similar games, but there are a lot of little details and quirks that have become de rigeur in online games at this point that WoW feels very behind in. Movement is one of the biggest ones. Most online RPGs now have quick, dodgy movement as a core mechanic, and usually many, many other baseline, easy to use movement tools. Ground-targeted short-range teleports are standard, characters stick to the ground when they move, slow-falling (or removal/elimination of falling damage) is implemented in a wide variety of ways, gap-closers and gap-openers are commonplace, the list goes on. WoW has had very tight, very responsive-feeling controls since its creation, but it hasn’t kept up with movement options. Most interesting to me here is the Demon Hunter, a class that, for no extra cost, gets double-jump and a gliding ability, as well as multiple forward dashes, a backward dash, and at least one targeted teleport (albeit tied to another ability and on a lengthy cooldown). 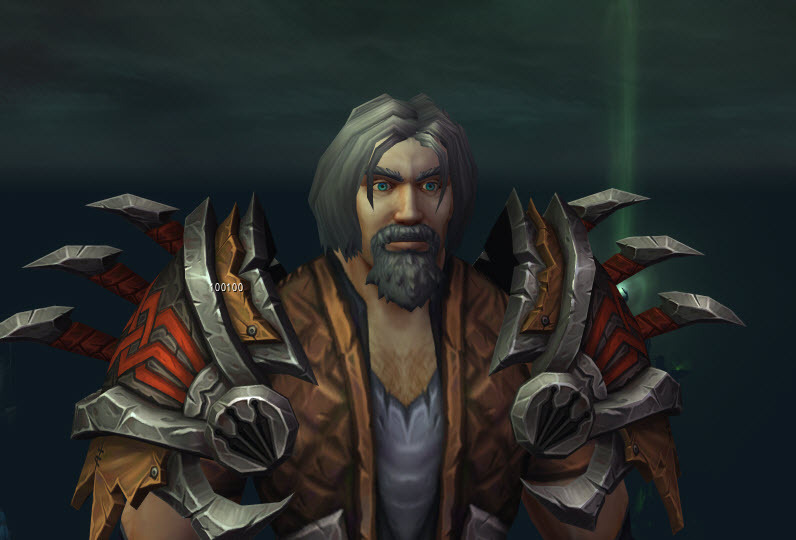 The Demon Hunter feels far more modern than any of the other classes, and it’s shocking to me that there wasn’t a similar revamping of movement for every class in the game, not just the one new one. Add onto that little quality-of-life things like a lack of one-button looting, no talk-to-NPC or quest-acceptance keybindings, and a constant need to click into the gameworld rather than letting smart-targeting handle that for you makes the UI feel clunky, even with (fundamentally required) addons. As an offshoot of the game being dated, there are a lot of places where the fidelity is surprisingly low. Few if any characters move their mouths when they speak, animations are jerky and don’t flow into one another, most armor is just a texture painted on one of a small number of models, with a couple of exceptions (shoulders) that stand out and bear the weight of a character’s appearance. It’s a throwback to when games pushed the limits on hardware frequently, and WoW could play on virtually anything. As the desperate need to keep up PC upgrades just to play games have slowed down thanks to console gaming (which is pretty much a good thing for everyone, certainly PC gamers’ wallets), lots of games have caught up to a modern hardware standard, and WoW, despite touch-ups where it can, sits pretty far back as far as visual fidelity goes. Playing WoW, FFXIV, GW2, Blade and Soul, and ESO in rapid succession really makes the fidelity more apparent, which brings me to the next big thought. Fourth, while graphics aren’t everything and fidelity doesn’t necessarily make or break a game, the lower fidelity and lack of ability to do subtle, nuanced graphical effects means that WoW has a very hard time being subtle. NPCs to talk to and objects to interact with stand out garishly and blatantly; the game basically shouts at you where to go and what to do. Not a problem when there’s a possible chance you might miss something, but considering the fairly few quest types in the game (kill X, click on X, talk to X) and how many of them you do (I’ve done at least a hundred quests just going from level 100 to level 106), it starts to feel like every quest is a tutorial. It’s a big thing that bugs me about the play experience. In roughly the same timeframe I’ve been playing WoW, I’ve also been playing Guild Wars 2. I’ve gotten one WoW character from 98 to 102 (Demon Hunter), and one character from 100 to 106 (Monk). I’ve gotten two characters from 40 to 80 in GW2, quite a bit of progression on multiple others, and still had time to spend unlocking masteries and completing the lengthy main story on my existing level 80 character. One of the big things that WoW used to pummel older MMOs into the ground — its relatively quick, painless levelling — now feels slow and ponderous, and like I have very little freedom. The game feels like a slave to its own paradigm, adding ten levels because That Is What Expansions Do without making those ten levels meaningful in any real way. Indeed, everything scales to your level, so the levelling process feels even more meaningless and like a bizarre chore you have to do if you want to play with your friends. I don’t seem to be learning anything in the 10-level process to prepare me for endgame, either; I haven’t gotten any new abilities since level 100 (my Artifact weapon skill) and I haven’t seen any meaningful enemy mechanics to learn how to counter. In a four hour play session, I got my GW2 Thief from 62 to 80 and maxed out his crafting skill from 0 to 500, completed a map, and got a full set of level 80 gear to be going on with, while also doing some character hopping and some story quests. In the same four hour play session in WoW, I got from (the end of) 102 to 106… and I was a lot more focused in WoW. Fifth and finally, tied to that last paragraph above, I’m intensely frustrated by what WoW represents in the gaming space. In achieving a stranglehold on the market, it’s had a severe chilling effect on everything else in the genre. What was once a widely varied, highly experimental genre is now… much less so. If I want to play an RPG with some progression and some group mechanics and actually have anyone to play with, I’m playing WoW. I’ve wanted to give group content in other games a shot basically since I picked them back up and haven’t been able to, but the sheer number of people playing WoW means I’ve wound up in groups virtually every time I’ve logged in. I feel like I’m renting friends on a monthly basis, where if I don’t pay up and log in, I don’t get to play games with my friends, and I better enjoy the game they’re all playing or I don’t get to play along. I haven’t decided which feels lonelier: playing a game I enjoy with just too few people to be able to do the more interesting stuff or playing a game that everyone else seems to like and I don’t. Currently I’m doing both, in the hopes that together I can fill the hole that neither one can fill separately. For now, I’m playing WoW. I’m legitimately enjoying some parts of it, but the shine is wearing off. I can predict the stories, I can see the shape of the systems, I feel like I’m well past being surprised. Maybe I’m wrong, and I think it’s important for me to brush up on games that are relevant even if I don’t personally enjoy them. As was true in Pandaria, the storylines that don’t involve the Alliance or the Horde are often very good, and there are plenty of cute jokes littered throughout. Class mechanics have become far less unwieldy (FFXIV could learn something about button efficiency) and there are plenty of nostalgic nods to previous eras of WoW. I’m just not as invested as everyone else is, and I know how that story ends. I’ve seen it happen enough times by now. I’m already on the edge of it now– I know I’m going to check out when the game asks more of me than I’m invested enough to give, and then doesn’t let me play meaningfully with my friends if I don’t do whatever it takes, be that a gear grind or a rep grind or whatever. I’m already behind in that regard, simply by dint of not being max level and able to do whatever they call max-level dungeons now, and it’s hard to work up the wherewithal to grind more quests to get there. In a move I find personally extremely frustrating, it became incredibly easy to run normal-mode dungeons with higher-level friends, but the exp gain from those is pretty paltry, so levelling through dungeons is infeasible. So, I grind for now, trying to catch up, so I can play with people I know and like and don’t get to play often enough with. I just wish this didn’t feel like the only choice I have if I want to play games with some of my friends.